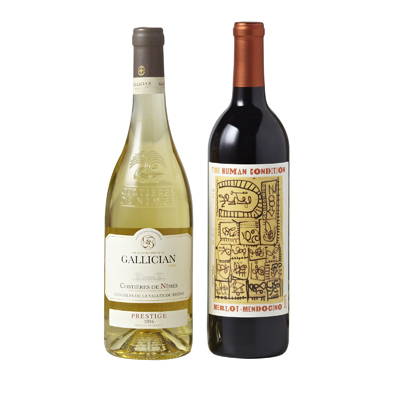 The most recent addition to our family at the WINE OF THE MONTH CLUB™, the Vintners Series gives you an opportunity to experience wines in a price range that offers a wider variety of grapes and growing regions. All the wines in each wine club membership are guaranteed for quality and value, and THE VINTNERS SERIES widens the spectrum of flavors. Each winery and winemaker has a personality to their wines. Like a chef, through their training and education, each winemaker carries a philosophy about wine throughout their wares. With this high-end wine club membership, you will receive 2 pre-screened bottles shipped to your door each month. One will be red and one will be white (or choose red wines or white wines only). There is no blueprint for the origin of the wines, although I do try to choose one domestic and one import. Buy with confidence and excitement as you are about to embark on a journey of wine appreciation through THE VINTNERS SERIES. These high-end wines are the winemaker's passion — wines he has representing his work. Compare with wines you might see at a wine shop for $18.00-$20.00/bottle. Monthly subscriptions are never more than $34.96 per month for 2 bottles, plus shipping & applicable taxes. I love discovering new wines from all around the world! I like my wines like my women. Full bodied and bold. And man, this wine club DELIVERS. (Get it?) I am a Cabernet Sauvignon enthusiast so I opted for the 2 reds option and it has actually opened me up to different varietals of reds that I previously thought were too mellow, or tasted too spicy, or "watered down" like Tempranillo. My complaint is that I only get 2 bottles per month. I'm considering joining the Cellar series so I can get 6 bottles and stock up my wine cooler before drinking it all. Let's me try all sorts of wine! I like exploring different options and the recommendations are excellent! When you live in a hot sweltering desert in the middle of nowhere with nothing to do except going to the shooting range where beers get warm very quickly, you crave something spicy and refreshing. When I was living in LA before I moved to this city, I used to indulge my taste buds with a different wine every night. The options were available. But now, the only place to get decent wine is the local liquor store, and they have a selection I could go through within a week. So I started looking for wine clubs, and found Wine of the Month Club! I've been a member for about 4 months now and getting my monthly shipment of wine is the highlight of the entire week. The wines are THAT good. Can't beat the prices either. What a great way to discover new wines. I feel like a wine expert because of all the different varieties I've tasted! I love the affordability of these fine wines! I love the variety and the price. I felt like I save a lot of money compare to if I was to go in the store and have the risk of getting a mediocre wine. My guests always love the wines, I am a happy customer. I've been ordering from them for many years and I have only had one small incident where one of the bottles somehow broke during shipment. My guess is that the carrier threw it or something. But Wine of the Month Club sent me another bottle with no hassle and free of charge! The people on the phones are always really friendly and helpful. Hard to find nowadays. I got this series for myself when I turned 21 since I am going to college at Humboldt and I love wine. It's a really nice little surprise in the mail every month. Really good wines and not hard on my wallet either. I love having wine with my friends. Me and my friends get together at my house to try the latest wine of the month! We are happy with having to try new varieties and the delicious taste. Impressed my mother in law with my last shipment! And that is hard to do. Thanks Wine of the Month Club! I love the variety and how delicious these wines are. Super! I would highly recommend this!! We signed up for the WCOM at a fair in Westwood (LA) in 1993. We have learned so much and experienced an immeasurable amount of joy tasting and evaluating the selections sent to us each month. After moving to Texas, we are thrilled to have this service again. May 22, 2009 | By E.S. "I love this! My husband and I were at the San Diego County Fair when we first got this and it is incredible! We have been completly satisfied every single month with almost every bottle. This beats going to the store and "guessing" what will be good. We can never decide between white or red so we get one of both every month and we are always amazed and satisfied! I love the recipies, the information. What a famtastic program! Thank You and keep up the wonderful work! "